Speaker Gloria Macapagal Arroyo on Wednesday asked the Department of Transportation to revise its proposed development of the Roll-On, Roll-Off transport system after most of the new routes being pushed had been found to be already existing or are being serviced by shipping lines in nearby ports. RORO REVISITED. House Speaker Gloria Macapagal Arroyo led the Oversight Committee on Transportation to look into the status of the RORO Transport System, which she launched during her administration in 2003, and revive some of the projects that had been shelved. The RORO transport system has been hailed as one of her noteworthy projects because it connected Luzon, Visayas and Mindanao, cut travel time, promoted tourism and increased trade. Conducting the Oversight Committee on Transportation hearing, Arroyo found out that the most of the 30 proposed new RORO routes under DOTr’s Maritime Industry Development Plan (MIDP) already have existing ports or are being serviced by other shipping lines. Having launched the Roro system in 2003, Arroyo went over each of the 30 proposed new routes to determine why 16 years later, the new routes remain unserved by the system. However, going through them one by one, it was established that most of them are already being served by shipping lines in nearby ports or there are already existing port facilities. For the proposed Jagna, Camiguin to Cagayan de Oro route. Arroyo found out that it was already being serviced by a shipping line. Arroyo suggested that they correct the proposed plan. “Please correct that because you might be submitting an ambitious but it does not have to cost that much,” Arroyo said. “If there is already an existing port nearby then maybe you can remove that to lessen the expected expenditures. There are many that you can take out so maybe you have to refine this plan. It will be a much shorter plan, easier to carry out,” she added. Lawmakers also noted the inability of officials from the DOTr, the Philippine Ports Authority and Maritime Industry Authority to answer some of the questions of Arroyo with respect to basic technical details like to the travel time, their location as well as the question of Marikina Rep. Bayani Fernando on the port charges being collected from container trucks. An expert in geography, Arroyo was well-versed in the location of the ports listed by the DOTr, their specific characteristics as well as their location from each other. When asked about the lapses in the information of DOTr officials, Arroyo said she does want to judge them but to move things forward. “Our job is not to judge them but to move things forward,” Arroyo said in an ambush interview after the hearing. Arroyo also suggested that for the unserved ports because of lack of operators, the DOTr should give missionary routes to shipping lines. A missionary route is an incentive given to a shipping line to service a new route exclusively for five years. “Giving the missionary routes, I don’t think you need an executive order for that. You know when I was president, not everything was done by executive order. The departments had a lot of leeways because you don’t want to clog Malacañang with executive orders,” she said. This was what she did, she pointed out, during her administration when nobody wanted to take the Dumaguete-Dapitan route. Years later, the route has become so lucrative that shipping lines are leaving the said ports every hour. “Nobody wanted to take it so we just force someone to take it and now they have a trip every hour. The incentive we gave for them to take it as it was a missionary route so they were given the privilege of being the sole operator for five years so it worked because since then there is a trip every hour on that route,” she said. 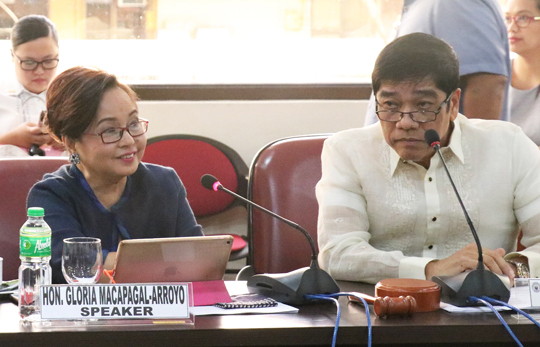 Arroyo convened the Oversight Committee on Transportation, chaired by Catanduanes Rep. Edgar Sarmiento, after her trip from Bacolod to Iloilo City over the weekend via the Roro to determine the status of the country’s Roro ports and how to improve them. “When I go back to Manila, I am going to convene the oversight committee for the RORO because with the help of the PPA (Philippine Ports Authority) and the DOTr (Department of Transportation) to compare the old ADB (Asian Development Bank) study with what are the the projects that had been canceled and see what should be revived,” she said. In 2003, then President Arroyo spearheaded the creation of the Road RoRo Transport System, a project designed to carry rolling stock cargo that does not require cranes for loading. The system was part of the 919-kilometer Strong Republic Nautical Highway that connected the major islands of Luzon, Visayas, and Mindanao through an integrated network of highway and vehicular ferry routes. It was one of her administration’s priority programs to ensure the fast and economical movement of goods and people and to boost domestic tourism and trade. The Asian Development Bank which had proposed the project had said the RORO system cut the cost of the transport system and travel time in the Philippines. During her presidency, Arroyo ordered the construction of 49 RORO routes from Luzon to Mindanao. However, the Aquino administration canceled most of the RORO projects approved during her time. The administration of President Rodrigo Duterte, meanwhile, decided to revitalize the RORO system citing its importance to trade and tourism. Today, there are a total of 140 Roro routes all over the country cutting travel time, promoting tourism and increasing trade. The RORO system has three routes: the Western Nautical Highway, Eastern Nautical Highway, and Central Nautical Highway. These cover the provinces and cities of Tagaytay and Batangas City of Region 4-A, Marinduque, Romblon and Oriental Mindoro in Luzon. Also covered are Aklan, Capiz, Guimaras, Iloilo, Negros Occidental, Negros Oriental, Siquijor, Cebu, and Bohol in the Visayas. There is also a route from Luzon going to Palawan. Misamis Occidental, Misamis Oriental, Lanao del Norte and Zamboanga del Norte in Mindanao are also part of the route.